Kidney Stone is a painful disease. It is usually found in individuals aged 30 to 60 years and four times more in men compared to women. In India, every one family from 2000 families suffering from this painful situation. But the sad thing is that some percentage of these patients tends to treat it. The operation is a treatment in allopathy. But the horse gram is the special medicine for this disease. 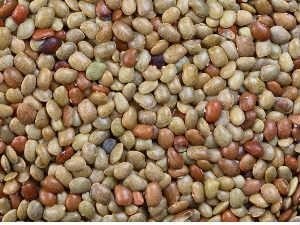 Horse gram is similar to urad. Its color is red. It can be given to the patient by making pulse. It is known as killer of stone. It is very useful for kidney stones and gall bladder stones. According to Ayurveda it has vitamin A. It fulfills the requirement of vitamin A in the body and prevents kidney stones. It is available in any grocery store. Stone is broken and become small by taking horse gram. So it is easily come out from the gall bladder through urinary tract. Due to properties of matral the urine volume and speed increases which increase the pressure on stone and so it gets particle and come out. It is very beneficial for 1 centimeter stone. Take 25 grams horse gram and 400 ml of water. Give it to the patient in the amount of 50-50 ml morning-evening. The stone will come out through urine. You should do medical checkup before and after taking it. You can also use it as other pulses. Take 25 grams horse gram, grind it thick and cook it in 16 times water. Filter the water when it remains in fourth part. Drink 50 ml water from it in morning-evening. You can also add rock salt in it. Stone do not occur: A person who gets stone he may get it again. After removing the stone patient should consume it sometime. Horse gram is panacea in stone.